African Business Education for youth?ABE Initiative, Tanzania? 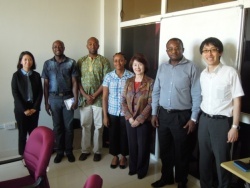 Ms. Sachiko Yamano, President of JICE, Mr. Takashi Akao, Deputy Director of International Students Division and Ms. Eriko Maegawa, Senior Program Officer of International Students Division, visited Tanzania from 18th to 20th of February, 2015. 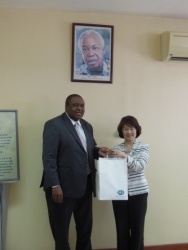 JICE delegation first paid a courtesy call on Japanese Embassy in Tanzania and JICA Tanzania office (Mr. Yasunori Onishi, Chief Representative). 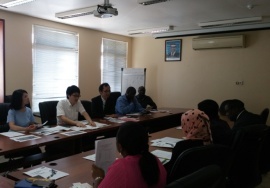 And then JICE delegation visited a newly established ABE initiative office and then three Tanzanian organizations; President’s Office – Public Service Management (PO-PSM), Institute of Management and Entrepreneurship Development（IMED） accompanied by Mr. Jiro Makimoto, program advisor, JICA Tanzania office to exchange opinions on more effective ways to implement ABE initiative program. ABE initiative office was established and is located in the central area of capital Dar es Salaam. 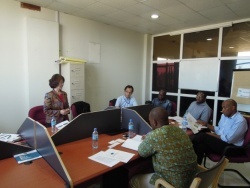 This office is coordinating with JICA Tanzania office and related Tanzanian governmental organizations to carry out ABE initiative program. 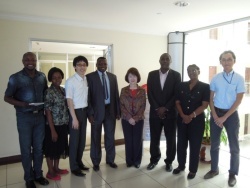 The next visit was PO-PSM which is a window organization of Tanzanian government side for ABE initiative. It plays an important role as a vice-chairperson in the Operating Committee that approves implementing policies and dispatch of successful candidates. Mr. Elisante M.Mbiwolo, Assistant Director and other senior members of PO-PSN welcomed JICE delegation and had opinion exchanges on ABE initiative. IMED is an organization which conducts training and research for the promotion of employment and entrepreneurship targeting young generation in Tanzania. JICE delegation met with Dr. Donath Olomi, Chief Executive Officer and other members of his staff who provided information on situation of entrepreneurship development in Tanzania. Discussion on a possibility of cooperation between ABE initiative and IMED’s activities was carried out. Then JICE delegation visited TPSF which is one of representing organization of Tanzania business community 252 companies belongs to. As for ABE initiative, TPSF gives recommendation letters to those candidates from member companies who apply for ABE initiative through TPSF. Therefore Mr. Godfrey Simbeye, Executive Director has high expectations on ABE initiative program in the sense that the program opens the door to general people working in the private sector. 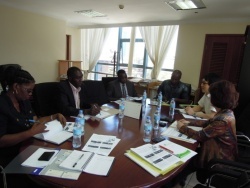 JICE delegation exchanged opinions on how to recruit qualified candidates who could win in the ABE initiative selection. Before leaving Tanzania, JICE delegation had a chance to meet a historian, Mr. Toshimichi Nemoto, who has been cooperating in ABE Initiative with Japanese Embassy in Tanzania, JICA Tanzania Office, and related educational organizations. He is the author of book on the record of the nation and the people from the perspective inside Tanzania, and the title of the book in Japanese “タンザニアに生きる―内側から照らす国家と民衆の記録』（2011年、昭和堂）”. He has been studying Tanzanian history from the era of His Excellency Mr. Julius Nyerere, Tanzanian first president, and JICE delegation wrapped up the African trip by touching Mr.Nemoto’s passion for Tanzania.